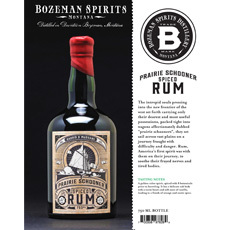 At Aurora Borealis Wholesale we strive to bring distinct spirits with rich heritage, history and tradition. We take the time to taste, to learn and to choose each one of our unique spirits and form lasting partnerships with the creators. Our boutique distilleries are dedicated to the production of small batch spirits and the story that goes along with each individual bottle. 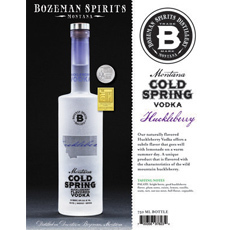 Naturally flavored Huckleberry Vodka offers a subtle flavor that goes well with lemonade on a warm summer day. A unique product that is flavored with the characteristics of the wild mountain huckleberry. 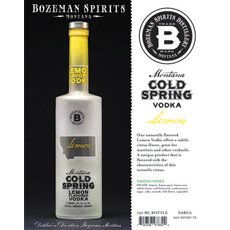 Naturally flavored Lemon Vodka offers a subtle citrus flavor, great for martinis and other cocktails. A unique product that is flavored with the characteristics of this versatile citrus. Palate: Lemon, lemon peel, lemon zest, subtle honey, well balanced, confectioners sugar, silky, smooth, full flavor, enjoyable. 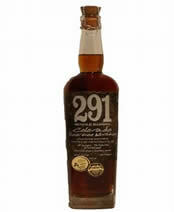 Palate: A delicate oak body with a warm heart and soft nose of vanilla, leading to a finish of orange and exotic spice. 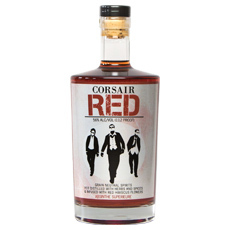 Hops and whiskey is an unexpected and unusual combination, but a challenge Corsair readily takes on. 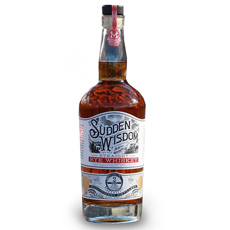 Their line of hopped whiskeys (all eponymously named after the dominant hop used in the manufacturing process) are as strange as they are polarizing. This is a whiskey for serious hop fanatics. 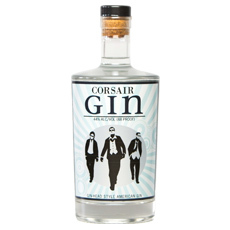 Palate: Using the vapor basket technology with which makes Corsair’s award-winning gin, they throw Centennial hops into the basket and let the white whiskey condense through the layers of hops, infusing itself with hop oils and flavor, which is then barrel-aged. The result is a whiskey bursting with the bitter, grassy flavor of Centennial hops. Corsair makes their gin in small batches using a vapor basket. By using this method, they are able to use alcohol vapor to strip flavor out of the botanicals instead of boiling them in the pot during maceration. This process results in a product that is light and crisp with a depth of flavor. Palate: Juniper, coriander, cardamom, lemon peel, orange peel, angelica, hyssop, orris root, chamomile flower, licorice root, and cucumber peel. 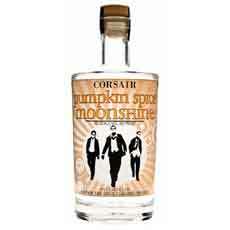 As the weather begins to get crisper, Corsair figured you should have a spirit specially designed to keep you warm, so they created Pumpkin Spice Moonshine. This unusual white dog whiskey is inspired by pumpkin ales. 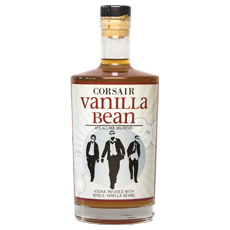 Corsair dot distills malted barley and malted wheat to malt a sweet malt whiskey. Next, they load the pot still’s vapor basket with ginger, nutmeg, allspice, cinnamon and pumpkin then redistill the whiskey to infuse and marry all the flavors. Pumpkin pie in a glass!! Palate: Pie spices come forward first followed by the full sweet flavor of the pumpkin and malt whiskey. Great in a Manhattan. 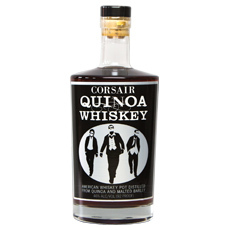 Barley malt and a good portion of quinoa make up the mash bill of this whiskey. Because of the growing global demand for this quinoa, Corsair’s quinoa is sustainably sourced from the Canadian Rocky Mountains in Saskatchewan. As seen on Gwyneth Paltrow’s Instagram. Palate: The distinct flavor of quinoa is very apparent on the nose and in the first sip. Nutty and earthy with light pepper on the palate and a slightly savory finish. Corsair’s take on the infamous spirit. 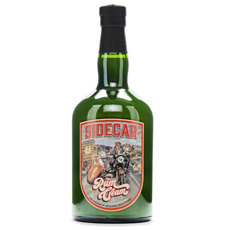 Their red absinthe is made using traditional botanicals, including wormwood and star anise, which give this Absinthe Superieure the clean notes of a classic blanche. Then, true to form, they put their own twist on the classic. This absinthe is infused with hibiscus flowers which impart their distinct scarlet color and fragrant floral notes. Palate: This brilliant red absinthe tastes strongly of licorice, with delicate notes of hibiscus. Notes of tarragon add a fresh green facet, which pairs well with the bitterness of wormwood. When used in the ritual of La Louche, this absinthe changes from ruby red to a soft opalescent pink. This is truly a beautiful spirit. 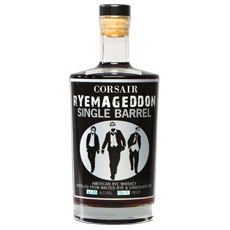 Rye, chocolate rye, and malted barley make up the base of this rich, delicious whiskey. Palate: Rye malt imparts spice. The barrel-aging process adds a gentle oakiness. The chocolate rye, which is rye grain roasted to a very dark brown, permeates the palate with a dark chocolate note. Altogether this is a rich, smooth rye. 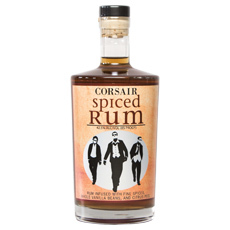 To make this unique spirit, Corsair spices their white rum with sustainably harvested baking spices, then barrel age it in new charred American oak barrels. The result is a dry, spice forward rum that mixes well. Palate: This rum is bursting with baking spice flavor. Nutmeg and cinnamon dominate the palate, with layers of orange and lemon peels as undertones. The organic, hand-split Madagascar vanilla beans used in the spice mix add a noticeable dry vanilla flavor to the midpalate. Hints of oak and wood sugar tie everything together. 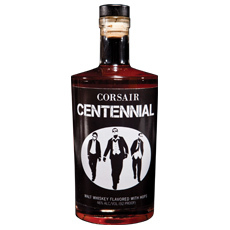 Whisky Advocate’s Artisan Whiskey of the Year The whiskey that put Corsair on the map. They use three smoked malts (cherrywood from Wisconsin, beechwood from Germany, and peat from Scotland) to craft this deep and complex whiskey. 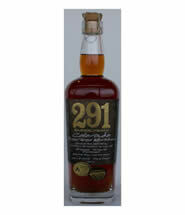 Palate: Smoke and notes of cherry pervade the palate, finished by a slight brininess from the mossy peat. 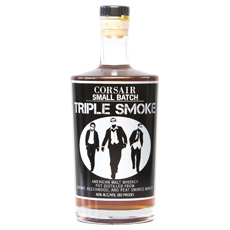 Pot distilled then barreled in new charred oak, Triple Smoke has the sweetness of an American whiskey with a single malt scotch’s rich smoke. Our Vanilla Bean Vodka is made with Madagascar Vanilla Beans, the best fair trade beans we could find, which are then hand-split at our facilities. The resulting spirit is dry, clean, with the unmistakable aroma and flavors of true vanilla. 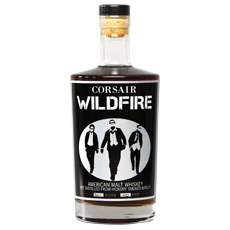 WILDFIRE is Corsair’s very first “grain to glass” whiskey, with barley grown, malted, and smoked at their farm in Bell’s Bend, nestled in the woods of rural Tennessee. Wildfire is 100% hickory-smoked, which gives it a unique flavor profile and smooth mouthfeel. It was introduced to their product line in 2015 and has quickly become one of their most popular whiskeys. 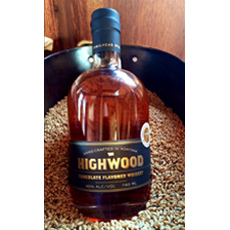 Palate: Hickory smoke is most commonly associated with a good Southern barbecue, whose flavors are fully expressed in this whiskey. Light smoke, caramel, and butterscotch come forward on the nose. 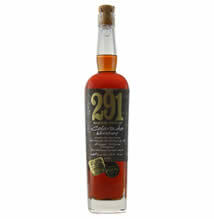 The overall flavor is of smoky barbecue; savory with surprising hints of spice with full body and rich mouthfeel. 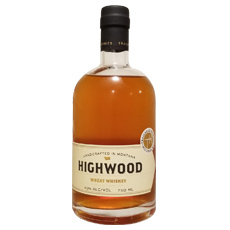 This whiskey is excellent as a sipper and gives a savory spin to classic cocktails. 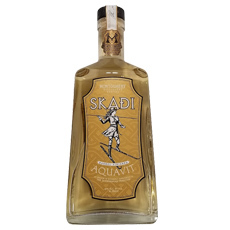 Skadi Aquavit is named for the Norse goddess of bow hunting, winter, mountains, and justice. It is handcrafted in Montana where many Scandinavians settled during the homestead boom of the 1910s. This barrel finished expression of our Skadi Aquavit is made in the Norwegian style. We use 200 liter, tight-grained Minnesota oak barrels after distillation, which add caramel and vanilla notes and a pale straw hue. Palate: Muted caraway and dill plus caramel and toffee notes. A slight spice from the rye barrel. Palate: Spice, dried ripe apple, and autumn leather. Trailhead gin is named after the Founder’s Great Grandfather Michael Healy. His pioneering spirit and entrepreneurial ingenuity enabled him to prosper during prohibition. In an era when the Butte copper mine was known as the richest hill on the earth, he was the toast of the town for his bootlegged spirits. 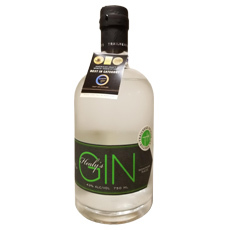 A modern American Gin balanced with a variety of botanicals including your traditional Juniper and Coriander, some non-traditional such as hops and Heather tips, and native plants like Sweet grass and Bitterroot. The result is a complex creation with local flair, a true Montana Gin. Palate: Juniper, coriander, hops and heather tips with a touch of sweet grass and bitter root. 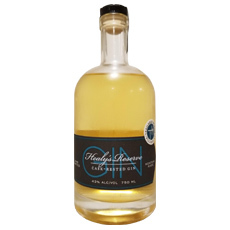 Healy’s reserve is Trailhead’s award-winning Healy’s Gin aged in used oak whiskey barrels. 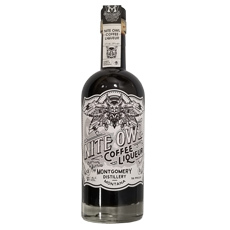 The result is a smooth sipping spirit that confuses your senses and intrigues your palate by imparting oaky characteristics from the barrel aging process that masterfully compliments the floral notes of the botanical base. Palate: Juniper, coriander, hops with a touch of sweet grass and bitter root complimented with oaky characteristics. Palate: Caramel and toffee with coco finish. An approachable whiskey made from winter wheat grown on the Founder’s family farm. This whiskey will delight your palate with flavors of sweet roasted grain, vanilla, and cocoa, accompanied with notes of caramel, toffee, honey, and burnt orange. This farm to glass project resulted in a very mixable whiskey that can be used to create a wide array of refreshing cocktails or enjoyed simply with a couple rocks. 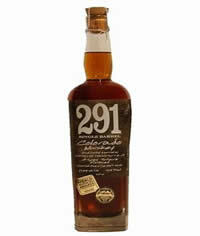 Palate: Sweet roasted grain, vanilla, and cocoa, accompanied with notes of caramel, toffee, honey, and burnt orange. We know that the award-winning spirits we offer and the care that we take in promoting these handcrafted spirits will forge long lasting relationships. To learn more about AB Wholesale’s selection of spirits, wines, craft beers, liquors and non-alcoholic beverages, please fill out our contact form or email us at contact [at] abwholesale.com.